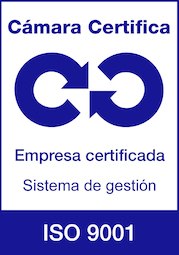 Carbon and graphite materials are manufactured according to processes based on conventional ceramic technologies. Raw materials such as petroleum cokes, pitch cokes, carbon black or graphite materials with a defined grain size distribution are mixed with a thermoplastic binder at elevated temperatures. 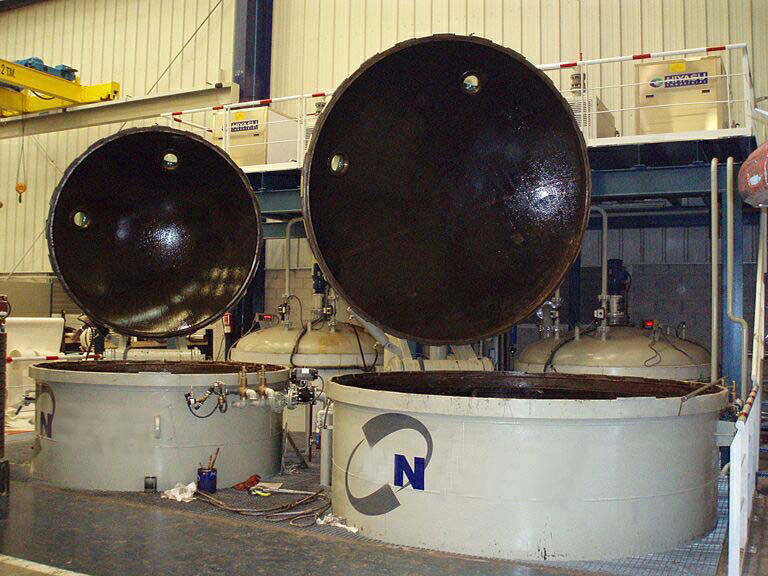 Coal tar or petroleum based pitches as well as synthetic resins are used as binders. Mineral additives or metal powders can be employed to achieve special material properties. As an example, copper powder is generally used for the manufacture of carbon brushes applied in low voltage motors. The mixing process is carried out in double screw extruders according to specific parameters such as throughput, screw configuration and temperature profile. 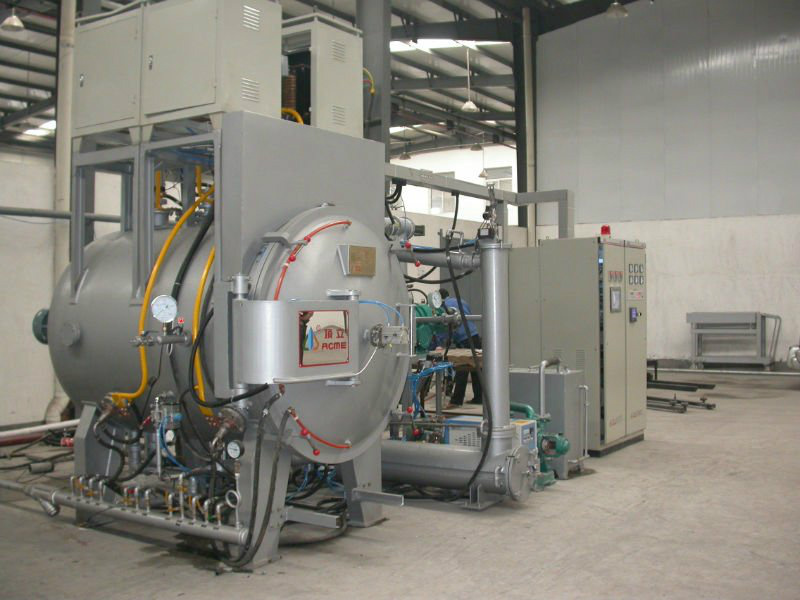 The ready-to-mold mixes are formed into “green bodies” by die molding, isostatic molding or extruding. The shaping process can be carried out at ambient or elevated temperatures; the pressure may vary between 2 and 400 MPa. After the shaping process, the “green bodies” are baked. 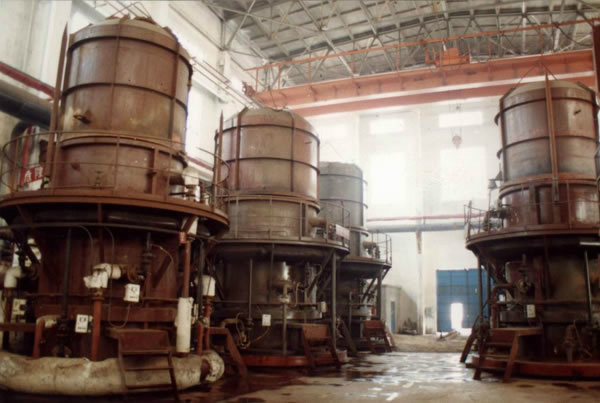 Depending on the type of material, dimensions and the required material characteristics, the baking process is performed in continuous or batch furnaces applying different heating rates, maximum temperatures (up to 1200°C/2190°F) and furnace atmospheres. During baking, the binder is decomposed into volatile components and carbon. This process is called pyrolysis. The resulting binder coke ensures the integrity of the molded and baked blocks. After baking, the blanks do not yet possess a complete graphitic structure. They are brittle and, generally, exhibit high mechanical strength and hardness. At this stage, the material is called carbon/graphite or “hard carbon”. It demonstrates properties suitable for certain mechanical applications, such as sliding rings and bearings. For many applications, graphitic properties are required which are obtained through the process of graphitization, a second heat treatment at temperatures up to 3000 °C (5430°F). Graphitization is mainly performed by applying the Acheson process, whereby the material to be graphitized is packed between two electrodes and connected as a resistance in the secondary circuit of a transformer. Thus, the graphitizing temperature is reached by resistance heating. During this process, recrystallization occurs, yielding in larger graphitic domaines with a higher degree of orientation. The material properties of the graphitized blanks are defined by the structural properties of these graphitic domaines. Graphitized carbon is called electrographite. Electrographite materials generally possess excellent sliding properties, low electrical resistance, high thermal conductivity and an improved corrosion resistance. They are used for applications where enhanced sliding properties, high resistance to chemical attack and temperature cycling as well as a high purity are required as an individual characteristic or as a combination of properties. 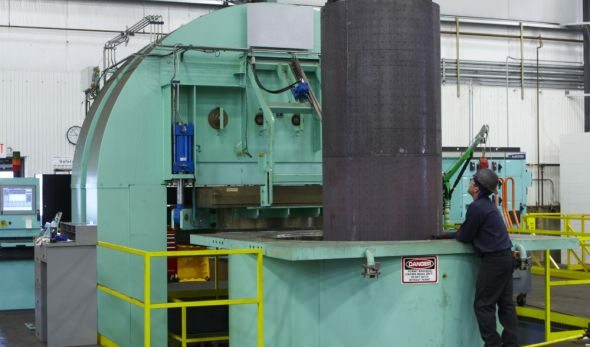 Inductively heated graphitizing furnaces or vacuum graphitizing furnaces are frequently used for carbon fiber-reinforced carbon (CFRC; C/C) materials as well as when the highest purity is required. 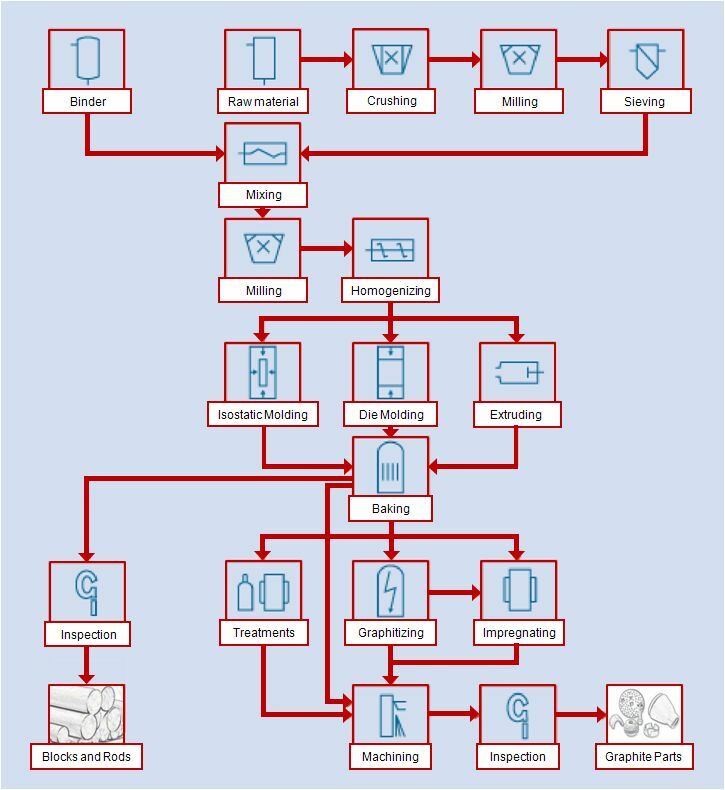 In addition to the production process for the basic material, there are many processes to generate special properties for particular applications. By impregnation with synthetic resins, the porous structure originated by pyrolysis of the binder can be made impermeable to gas and liquids. By impregnation with metals, an increase in hardness and strength by a factor of 2-5 can be achieved. Special properties can also be achieved by resin bonded carbon materials. Materials impermeable to liquids and gases can be produced without being subjected to the coking and impregnating process. Because they are not graphitized, such materials have moderate sliding properties, which can be improved by using natural graphite or synthetic graphite as raw materials. Resin bonded carbon materials can only be used up to the curing temperature of the resin, generally 180 °C to 280 °C (350 °F to 530 °F). The production of low electrical resistance, resin-bonded materials is not possible because of the isolating properties of the resin. Based on the special bonding characteristics of the carbon atoms in the graphite lattice, graphite crystallizes in a hexagonal layer structure. The enhanced sliding properties, the anisotropy of electrical and thermal conductivity as well as the coefficient of thermal expansion are characteristics which depend on structure and bonding of the graphite. The chemical properties of carbon materials are also determined by the bonding conditions of the carbon atoms within the lattice. 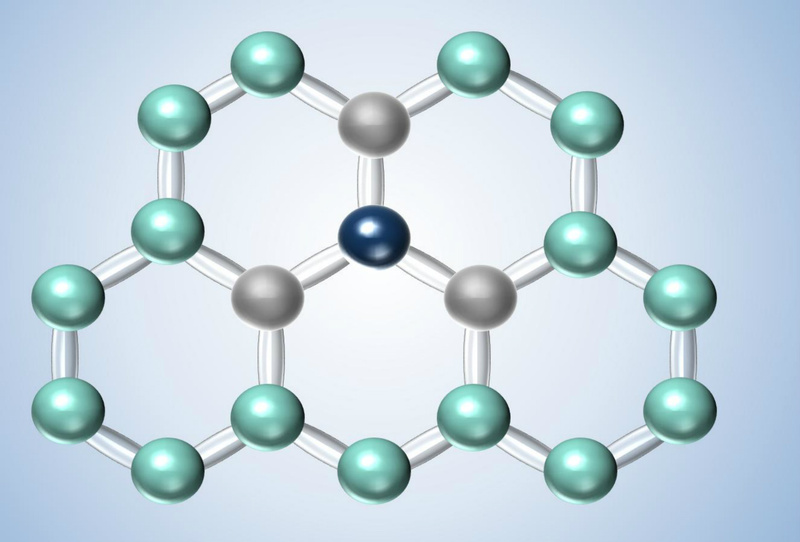 Due to the high strength of the covalent bonds within the lattice layer, carbon materials exhibit a high resistance to acids, bases, gases, melts, etc. The resistance of carbon materials is only limited by strongly oxidizing media and oxygen. In oxidizing atmospheres carbon graphite materials are stable up to 350°C (660°F), whereas graphitized materials start to be oxidized at 500 to 600°C (930 to 1110°F). Up to these temperature limits at least the shortterm service will not be restricted by oxygen attack. In addition to the properties depending on structure and bonding, carbon materials show characteristics which are related to the manufacturing process. Carbon manufactured according to the production method described above will have a polygranular and polycrystalline microstructure. Frequently, the microcrystallites already present in the grains of the solid starting materials are randomly oriented, so that nearly no remaining anisotropy of the crystallites is measurable. Porosity is a property particularly influenced by the manufacturing method and can be varied between 0 and 50 %. The porosity can be defined by the pore volume and the pore size distribution, both being characteristic for different material and production methods. In general, there are both open and closed porosity. Open porosity can be filled by impregnants, whereas closed porosity cannot. 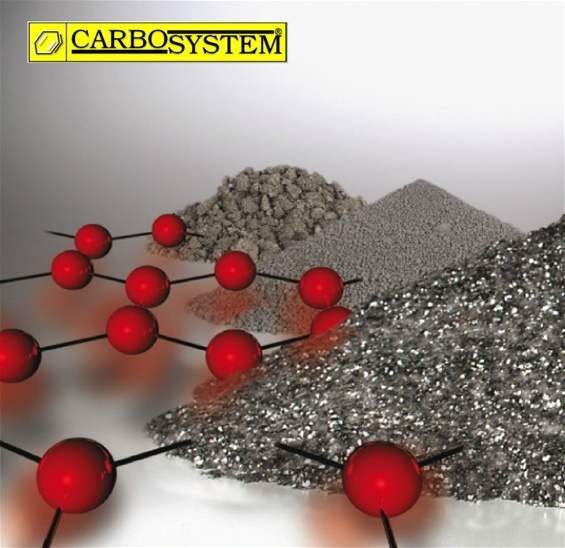 Due to the porosity and the different graphitizability of various carbon materials, all industrially manufactured polycrystalline carbons exhibit a lower bulk density than that which is calculated theoreticallybased on the ideal crystal structure of the graphite. Depending on the production method, bending strength and compressive strength can be varied within wide limits. The bending strength may vary from 10 to 150 MPa. Carbon and graphite materials are generally manufactured in polygranular and polycrystalline form. This means that the blanks show a random orientation of crystallites. Due to this microcrystalline structure, a macroscopic blank does not show the typical anisotropic properties of a graphite single crystal. With polycrystalline materials, the extremely high anisotropy of the electrical conductivity or coefficient of thermal expansion is greatly reduced or nonexistent. The anisotropy of properties which occur in polycrystalline carbon materials does not only depend on the properties of the raw materials, but also on the molding method. Isostatically molded carbon materials, for example, show little or no anisotropy, whereas uniaxially or biaxially molded parts exhibit increased anisotropy. The data given for properties parallel and perpendicular to the molding direction vary and are, therefore, indicated separately. An additional class of technical carbon materials are carbon or graphite fibers. They are manufactured by pyrolysis of polymer fibers, preferably polyacrylnitrile (PAN), or of special pitch based fibers. Carbon fibers are used for the reinforcement of polymers (carbon fiber-reinforced polymers; CFRP), carbon (carbon fiber-reinforced carbon; CFRC, C/C), ceramics (ceramic matrix composites; CMC), and metals. These composites are normally used when high stiffness and strength together with low weight play a decisive role. Typical applications of CFRP are sporting goods and components for aviation and space technology which are not submitted to high temperatures. For high temperature applications, e. g. in the semiconductor industry or furnace construction, C/C is the accepted material.